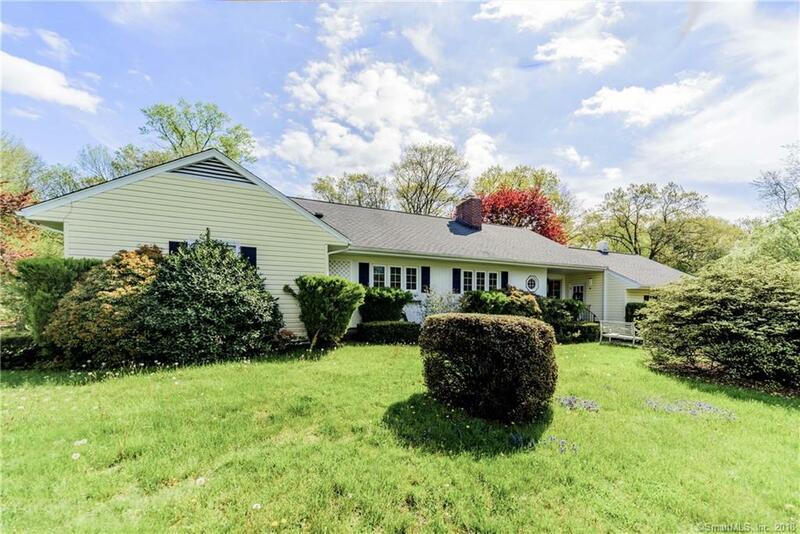 Gorgeous private ranch bordering New Canaan/close to merritt on 1.59 flat acres with beautiful plantings and seating areas. Totally updated to very high standard over past 9 years. All new windows, wave dehumidification system system, new well pump and new well water filtration system, wired for generator. Designer high quality updated kitchen and baths. Central vac, two zne heating, crown molding throughout. This house has it all - great for downsizing but also plenty of room for expansion. Great use of marble and high end appliances, top quality materials and imaginative dÃ©cor. Huge marble island. Lovely screened in porch. Photographs do not do it justice. Photographs showing furniture are from prior to renting. Tenants with small child currently in place. Please call listing broker to arrange access. Owner has ascertained there is possibility of connecting to city sewer and city water from Leslie Road which adjoins the property. Buyer to do due diligence on this.